Asthma is basically a respiratory disorder, which blocks the air ways. In many cases, the causes could not be detected; but they may be genetic and environmental. 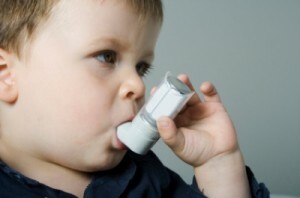 Asthma in toddlers often occurs due to the inflammation in lungs and airways when they are exposed to triggers like airborne pollen or air pollution. Emotions, such as crying, yelling, and laughing or some strong reactions and stress can also trigger wheezing or coughing in babies. Other important reasons of causing asthma in babies include respiratory infection, cold, hereditary or some other sudden changes in external factors. How To Prevent Asthma In Babies? Diagnosing childhood asthma at home is not always easy. However if your kid experiences see-saw movements or retractions in the chest then it is possible that your child is suffering from an asthma problem. Other few issues noticed in a kid’s health during the childhood asthma are dark circles under the eyes, frequent headaches and loss of appetite. It should be noted that the situation and asthma symptoms interferes the baby especially at times when they play, go to school or while sleeping at night. While playing or laughing your child might get frequent coughing spells. Sometimes they might have to stop in between sentences while talking to catch up with their breath. The wheezing sound that comes along with this cough is the very first signs of childhood asthma. Signs and symptoms of asthma in babies may vary and may get better or worse over time. Your child may show one or more asthma symptoms or signs at a time. So in many cases it becomes difficult to determine whether your infant is suffering from asthma or something else. However as soon as you feel that your child has been suffering from asthma condition, take him/her to the doctor immediately because early treatment can help control the symptoms and can also prevent frequent asthma attacks. Care that, some unmanaged asthma conditions can cause serious asthma attacks as well so it is best to take your child to a doctor so as to prevent childhood asthma outgrow. Asthma in infants or toddlers can be a complicated problem if ignored for some time. Serious cases include pulling inward of chest or sides when your child struggles to breathe. Toddlers may experience increased heartbeat, cheat pain or sweating in severe conditions. Asthma in babies and toddlers can be prevented or controlled by trying some effective methods. Keeping the home clean and at ideal humidity levels should be your major concern as it will help the babies stay away from the onset of this disease. You should also take corrective measures to keep your surroundings clean; care that they do not play in those dusty playgrounds. You should avoid your baby to get in contact with allergens like pet dander, cigarette smoke, pollen and dust mites which are most of the times responsible for asthma attacks. Especially if your infant is already suffering from asthma or cough, you should use a peak flow meter to check often about how well your baby’s lungs are working. Take a control on their playing and sleeping hours so that they do not suffer frequently. With patience you can also use some medication and home remedies that can keep your baby’s asthma attacks under control. Best for you is to learn more about asthma and about the ways by which you can manage and control it in your baby. With the help of your doctor, learn about the best types of medications for asthma and how they work. You doctor can also help you in knowing about what should be done when your child’s asthma gets worse. Childhood asthma is not curable and signs may continue into adulthood. However, if you provide toddlers with the right treatments, you can keep the signs under control and avoid more damages to your baby’s lungs. Doctors recommend to create an asthma action plan for your baby which will help you or your baby’s caregiver a lot. This is important in order to monitor the asthma symptoms in 1-2 year old baby and to know about what to do when an asthma attack takes place. Starting symptoms of asthma in babies under 12 months can be easily relieved by providing nebuliser treatment. However for toddlers, kids and teenagers, small hand-held devices and metered dose inhalers are also some of the best ways by which asthma can be controlled or managed. 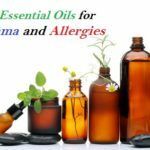 How to Cure Asthma Without Medicine? Other than nebulizer medication and hand held devices, natural remedies for asthma in toddlers are most of the time preferred (than as compared to medications) as these are completely safe. Breast milk is one such absolute solution to prevent asthma in infants. Provide your infant with breast milk from birth up to 6 months, so that a strong immune system can be built. Lactating mothers need to avoid things such as cough syrups containing iodine, opiates, aspartame, caffeine, tranquilizers, chocolates and most importantly, smoking so that their infants does not get affected. Infants with asthma can also be relived to some extent by providing them soft massage. You can rub your infant’s skin using walnut oil, eucalyptus oil or flaxseed oil. It includes a mixture of Omega-3 and 6 that builds a strong immune system and can help in avoiding the future problems. 1- Honey: This is one of the oldest and most effective home remedies for asthma wheezing in kids. Hot water with a teaspoon of honey mixed in it can be given to your child three times a day to stop asthma cough naturally. 2- Lemon: This is yet another effective natural home remedy for asthma cough in kids. As it is rich in Vitamin C and antioxidants it easily work to prevent the symptoms of asthma from occurring. In a glass of water squeeze half of the lemon. Add sugar according to your child’s taste and make them drink it regularly. 3- Ginger: This is also one of the greatest natural medication for your child’s asthma condition. Besides reducing the airway inflammation it also helps by enhancing the muscle relaxant effects of certain asthma medications. Ginger juice mixed with equal amount of pomegranate juice and honey can be prepared and given to your kid (1 tablespoon 2-3 times in a day) for getting soothing relief. 4- Garlic: This spice is known for various benefits and relieving your child’s asthma attacks is one of them. Boil 2-3 cloves of garlic in a small cup of milk. Cooled down milk at room temperature can now be given to your toddler to clear the lung congestion and cough. 5- Onion: Due to its rich anti-inflammatory properties onion can prove helpful in clearing the air passageways of your kid while he/she is suffering from asthma. Simply giving the cooked onions in their diet can help them in easy breathing at night. Besides all the above home remedies, Ayurvedic treatment for bronchial asthma in kids can also prove useful in many cases, according to which giving your kid a healthy and nutritious low-sugar diet can help a lot. Try to include fresh vegetables, fruit, seeds, nuts, brown rice, whole grains etc. in their daily diet. Apart from various types of healthy diet, there are few things that must be avoided in their diet. Milk products are not at all good for asthma. The dairy products contribute toxins and are responsible for the formation of mucus in the body. You should therefore avoid all types dairy products like cheese, butter, ice cream, etc. in their diet. Moreover, intake of plenty of water helps in removing the toxins and mucous from the body and should not be ignored.